McDonald’s offers a wide range of foods such as burgers, wraps, beverages, and desserts. All food items are made using fresh ingredients and are highly nutritious. McDonald’s India offers a new set of burgers and meals to fit the needs of Indian customers. Quench your thirst by trying some of the refreshing beverages at McDonald’s. The beverage menu of McDonald’s includes Ice Tea, Cold Coffee McFloat, Black Tea, Fresh Brew Coffee, Coke and others. Few beverages are offered for free along with the meal order. Offers vary at stores. Give your meal a happy ending with a yummy dessert. List of special Desserts available at McDonald’s include McFlurry Oreo, McFlurry Choco Crunch, Soft Serve Strawberry, McSwirl Chocolate and others. The Happy Price Menu of McDonald’s lets you enjoy a hearty meal at low price. You can enjoy even more with the economical Econo meal of McDonald’s. Econo meal starting at a price of just Rs.89 includes fries, burger or wrap and a mini coke. Check for McDonald’s promo codes in this site and save more on your order. You can get more discount through Foodpanda. While you can book McDonald’s food through foodpanda to get additional discount. To get those offer check Foodpanda Coupons and save more. 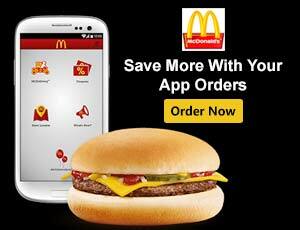 The all new McDonald’s mobile app simplifies food ordering. Using the app is not only simple but also comes with wonderful free offers. Just browse over your mobile for McDonald’s app offers, pick the one of your choice, order the food and enjoy scrumptious meal at a low price. The App is free to download for Google Play Store, App Store and Windows Store. McDonald’s customers can find videos, images, and information about the recent menus and promotional events on these social media platforms. McDonald’s makes the festive season even more exciting with its special discounts and free offers. Enjoy a delicious breakfast at any time of the day and grab a free McMuffin of your choice with McDonald’s breakfast coupons. McDonald’s Extra Value Meals make you happier by allowing you to choose the items of the meal. The extra value meal includes medium fries, a beverage of your choice and a burger, wrap, or McMuffin of your choice. You can get more offers in Zomato also for food. So before choosing food you can check those offers once. Happy Meal from McDonald’s makes your meal even more enjoyable with a new toy every time you order the meal. Experience the authentic Chinese flavor in every bite of new chilli paneer pockets that are loaded with finely chopped vegetables. McDonald’s tries to bring out new foods with varied flavors to give its customers a unique food experience and also to withstand the competitive retail food market. To make its menu more affordable McDonald’s has introduced Happy Price Menu, Econo Meal and others. Customers can save more on their food orders by providing McDonald’s offer codes at the time of placing the order. It is not just free offers and discounts McDonald’s has more to offer for kids. Order your kid’s favorite meal at McDonald’s and present them an exciting toy. Some of the interesting toys that kids can have along with their Happy Meal order include Raphael Bike, Leonardo Spinning Ninja, Dance Bracelet and more. However, toys will be provided based on the availability at the specific store. Pros: Exciting Discount Offers On Every McDonald’s Order. McDonalds’ serves with the motto of quality, service, cleanliness and value. It offers super saving McDonald’s coupons to its customers to save on their food orders. All foods are made using native spices and chillis to bring the authentic spicy Indian flavor. The delightful menu of McDonald’s India includes McAloo Tikki, McVeggie, Veg Pizza McPuff, and an assortment of wraps. At McDonald’s, burger lovers can get a free burger, muffin or a soft serve on orders above a certain price limit. Free offers are also available on large meal orders. 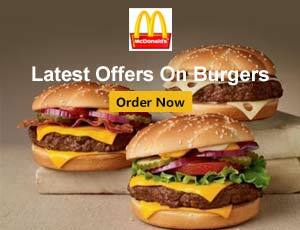 Check out the interesting offers being offered at your favorite McDonald’s restaurant at this site. Like McDonald’s, Swiggy also giving great discounts on burger orders. So simply check Swiggy Coupons before making a food order. McDonald’s provides huge discounts on party orders and on gift vouchers. 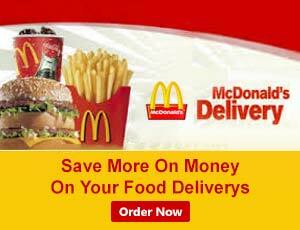 Use McDonald’s online coupons and get special discounts by ordering online. Using McDonald’s free coupons you can even avail cash back on your meal orders. Some of the Indian style burgers offered at McDonald’s include Veg McMuffin, Veg supreme McMuffin, McEgg, Masala Grill Veg, McSpicy Paneer, McSpicy chicken, Masala Grill Chicken and more. McDonald’s also offers appetizing wraps such as Spicy Chicken Wrap, Spicy Paneer Wrap, Grilled Chicken Wrap and more. Some of the sides you can savor at McDonald’s include French Fries, Chicken McNuggets, and Hash Browns. The colorful and vivid ambience at McDonald’s restaurants makes it a perfect place for family gatherings. McDonald’s Arch Card, a pre-paid card is a perfect gift to anyone. It is a perfect way to reward anyone on their success or express your gratitude towards your employees. McDonald’s gift card can be purchased at any of the McDonald’s restaurants and can used without any extra charges. Customers placing orders through McDelivey restaurants run by Hardcastle Restaurants Private Limited (HRPL) can obtain free McDonald’s coupon on their orders. The program is valid in cities of Mumbai and Navi Mumbai only. Customers purchasing a McDonald’s burger, fries, drink or any other item at McDonalds for regular price for the first time shall obtain a free offer coupon that can be redeemed in the next order. Using the free offer coupon, the customer can get a McChicken burger or McVeggie burger for free in the next order via McDelivery. However, the order has to be placed within 10 days of receiving the coupon. In KFC also you can get discount on home delivery. To get that discount check KFC Home Delivery Offer and get delicious food with lesser price. Customers ordering food at McDelivery restaurants for the fifth time can get a free offer coupon that can be redeemed on the next order of the Large Value Meal. Using the coupon, the customer can not only get a McChicken burger or McVeggie burger for free but also a McDonald’s mouse pad, McDonald’s Keychain, or McDonald’s Note pad with a pen for free. To avail the coupon, the customer has to place the next order within one month of receiving the coupon. Customers ordering food at McDelivery restaurants for the tenth time can get a McDonald’s Coffee Mug and a “Be Our Guest” voucher for free. Using the McDonald’s vouchers, the customer can get a McDonald’s Family Value meal for free at any of the HRPL McDonald’s restaurants. To avail the offer, the voucher has to be redeemed in person within one month of receiving the voucher. Have a fun filled memorable birthday party at McDonald’s at discounted prices. Celebrating birthday at McDonald’s is very simple. Just book a birthday party for your kids and the rest will be taken care by the friendly staff at the store right from hosting the celebration to providing return gifts for kids. Birthday hats and invites will be provided to the guests and the birthday child gets an exceptional card and hat. The entire place will be made colorful with balloons and other decorations. Find the list of return gifts, game prizes etc. at McDonald’s site and pick gifts of your choice. Similarly, you can order food of your choice from the menu or order the kids Happy Meal. To ease the food ordering process, McDonald’s offers multiple payment options. You can pay cash or pay using debit card. Credit cards of Visa and MasterCard are also accepted. Net banking facility is also available with online orders. McDonald’s the world renowned fast food restaurant is popular for offering a variety of burgers, sides, desserts and beverages. McDonald’s first Indian restaurant was opened in 1995 by Vikram Bakshi and Amit Jatia as partners. In the past 20 years, the burger franchisee was able to garner a huge customer base across India and they operate in multiple locations primarily centered in malls, metro stations, highways and railway stations. Food items at McDonald’s are prepared using the renowned Indian spices and sauces that ensures that the authentic Indian flavor is maintained. McDonald’s customers can grab wonderful free and cashback offers on their orders with McDonald’s free coupons. Just give the McDonald’s offer codes at the time of ordering the food and enjoy exciting free offers. With their Happy Meal product, kids can get an exciting toy for free. McDonald’s restaurants serve quality and nutritious food for its customers. Pleasant ambience and friendly staff at the restaurant lure customers to revisit the restaurant to celebrate their happy moments. McDonald’s is one of the leading fast food restaurants in the world serving customers in 119 countries through its 35,000 outlets. The restaurant entered the Indian food market in the year 1995. The entire franchise of McDonald’s is managed by two business entities in a joint partnership. Those two entities are Connaught Plaza Restaurants Private Limited, managed by Mr. Vikram Bakshi, Managing Director for North and East India and Hardcastle Restaurants Private Limited, managed by Ms. Smita Jatia, Managing Director South and West India. McDonald’s has been serving Indian customers for the past 20 years with a variety of foods that best suit the food habits of Indians. The first disabled friendly restaurant opened at Noida, UP in 1997 showing McDonald’s commitment to serve its customers. With the growing market demand, McDonald’s stores have increased in numbers making their presence in malls, highways, and metro stations. Few of the McDonald’s restaurants at railway stations serve customers 24×7. What Is McDonald’s Contact Number? To locate a store near to you or to know the menu you can call their customer care service at 91-11-24604047 or 66000666. You can also email them at [email protected] Customer service at McDonald’s is very good. All customer calls and emails are answered without fail and they provide the needed information to the customer.